ShedTech and Shed Alliance is pleased to announce that we have been granted Shed Safe Accreditation by the Australian Steel Institute and Steel Shed Group. ShedSafe® accreditation cannot be purchased - it has to be earned and ShedTech’s 3D dynamic engineering software system, designs and engineering procedures have undergone a rigorous independent auditing and certification process by an ASI appointed panel of independent engineers and specialists. 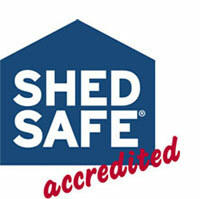 Primarily, ShedSafe® is about safety for the consumer and it serves to protect the investment in a shed and its contents. Consumers can be confident in the fact that ShedTech and Shed Alliance ensure that all standards set by the BCA are incorporated into the design process of each shed. ShedTech is able to provide site specific engineering calculations proving that the shed design is suitable for specific sites and locations. Whether you are buying a shed or for a weekender, a custom carport or a farm building, Shed Alliance has the biggest range, the best quality and competitive pricing to suit everyone’s needs. All this is delivered with real peace of mind that your new building investment is strong and ShedSafe. So when you are looking at purchasing a shed, ensure to check if the manufacturer is ShedSafe accredited....and if they aren’t then you have to ask yourself....Why not!!! Speak to a Shed Alliance dealer now to buy your independently approved new steel building! This will give you extra peace of mind with your purchase decision. Search for your nearest dealer.